Zapier enables you to integrate Pipefy with over 1000 web apps. This article will teach you everything you need to know about setting up an integration between Pipefy and other apps via Zapier. A Zapier account (Zapier offers both free and paid plans. Check out their pricing page for more information). Before you start creating new zaps (that's how integrations via Zapier are called) you'll need to create a new Zapier account or sign in if you already have one. Click the ‘sign up’ button or fill in the form in their home page. Zapier works by creating automated workflows between two or more apps. Those workflows are called zaps. Each zap has a trigger and one or more actions. In the simplest scenario possible, when something happens in app A (trigger), something else will automagically happen in app B (action). Pipefy can be used both as a trigger and action in your zaps. To help you get started with Zapier integrations, we recommend you check out some of the pre-developed Pipefy integrations available in Zapier (click here to check them out). Using a recommended Zap is typically quicker than creating your own from scratch. This is just a suggestion, though. If you'd rather create your Zap from scratch, that's okay! 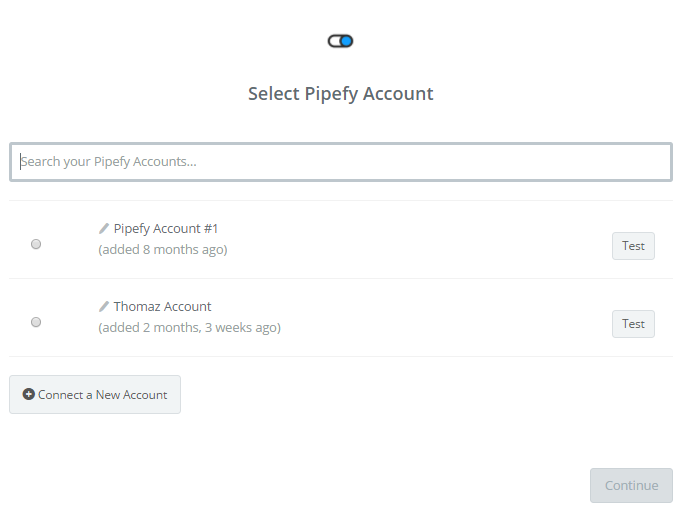 If you haven’t integrated Zapier with Pipefy yet, Zapier will ask you to add your Pipefy account when you decide to use Pipefy as a trigger or an action. 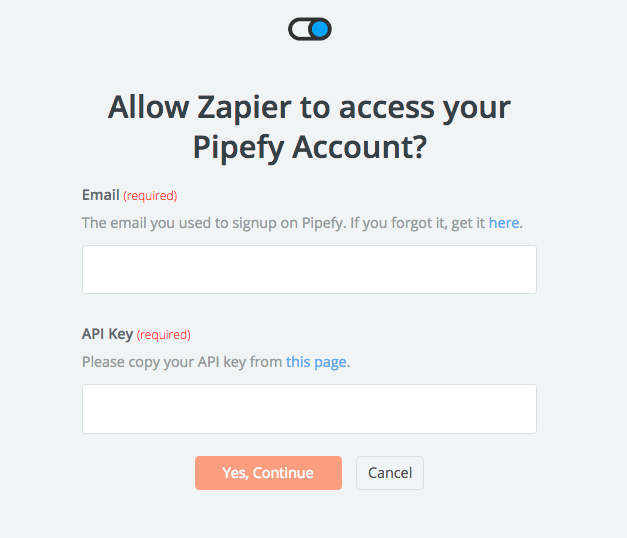 The API key is a code that works as an authorization for Zapier to access your Pipefy. To get it, click on 'this page' to be redirected to your 'user settings' page in Pipefy. At the bottom of the screen, you'll see the API key option, click on it to open the dropdown with your API key. Copy and paste the code in the pop-up window and you're good to go. Creating a new Zap is really easy. The first step is clicking on the orange 'Make a Zap' button in the upper right corner of the main Zapier dashboard. As we've mentioned before, each Zap is made of a trigger and (at least) an action. The first step for creating any Zap is setting up the trigger. 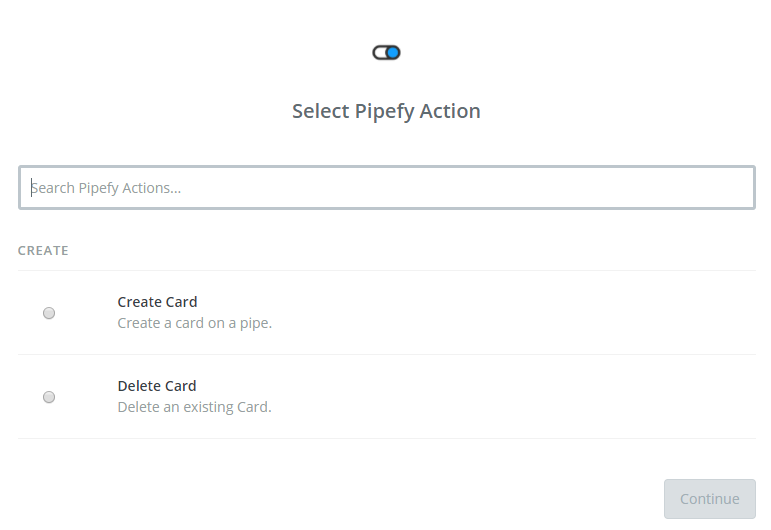 We'll explain how you can set Pipefy up both as a Trigger and as an Action with simple examples. If you decide to use Pipefy as a trigger, an action will be triggered in another app when something happens in Pipefy. You'll type 'Pipefy' to search for it and select it as your trigger app. The next step is selecting the trigger in Pipefy, what will happen in Pipefy to trigger the action in the other app. Card Done: The action will be triggered whenever a card enters a final phase in a specific pipe. 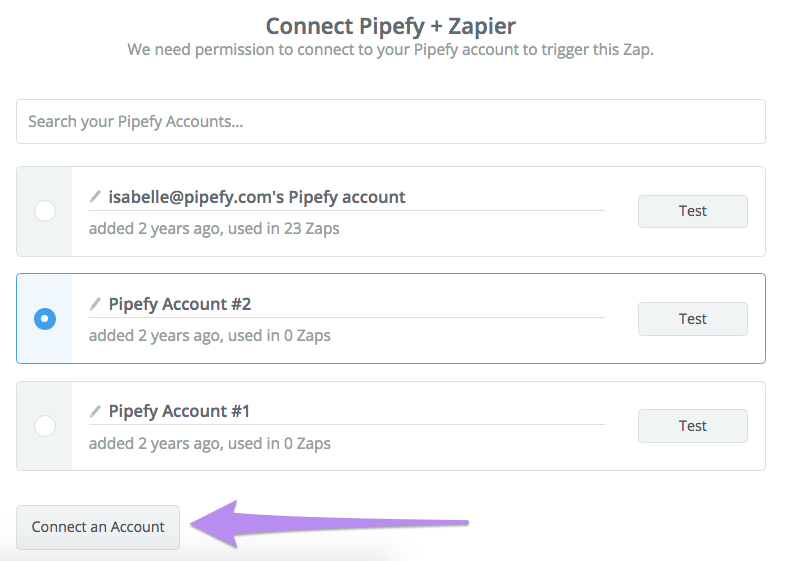 After you select the trigger in Pipefy, Zapier will ask you to select/add your Pipefy account (if you haven’t added your Pipefy account just yet, learn how to do it in step 1 above). For this example's purpose, we chose "new card" trigger. Therefore, it makes sense to select in which Pipe the cards will be created in order to trigger this action. After you select the pipe from the list of pipes, you'll be asked to test your trigger to check if it’s working. After you receive the confirmation that your trigger is working, it's time to move on to the action you want to be triggered. 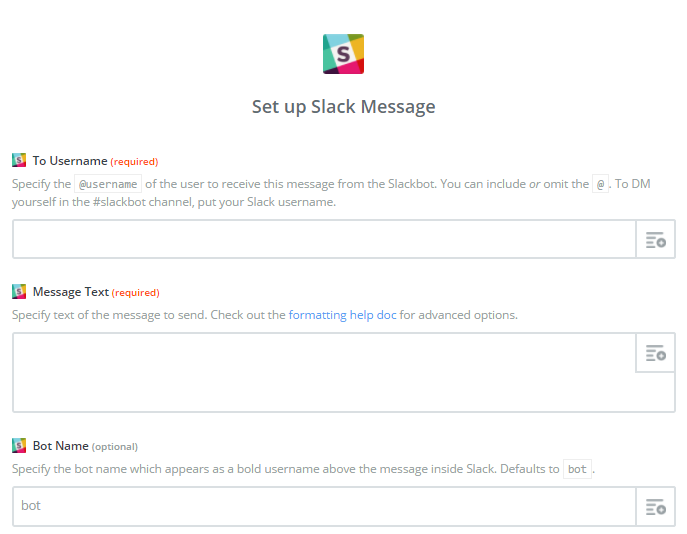 For this example's purpose, we chose Slack as the Action App. As we selected the trigger in Pipefy, now we'll select the action we want our Zap to trigger in Slack. For our example, we've decided we wanted Slack to send ourselves a direct message (via slackbot) whenever a new card is created in the pipe we selected. 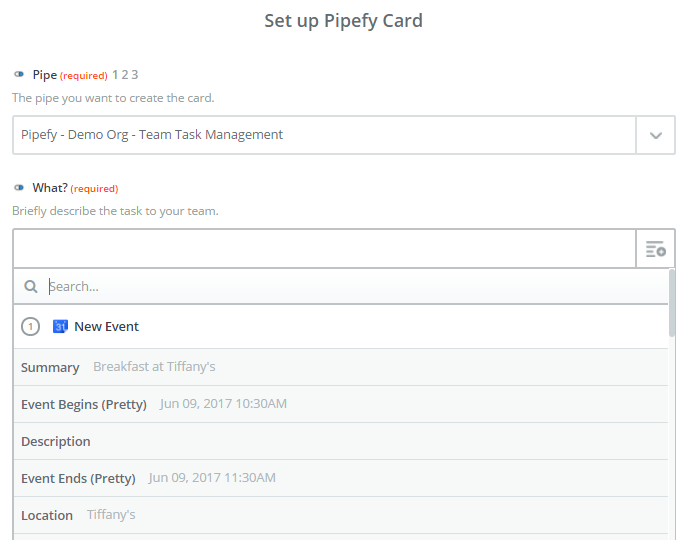 To be able to send yourself a direct message whenever a new card is created in Pipefy, you'll need to validate your Slack account just like you did with Pipefy. Set up the notification message you want Slack to send you when a new card is created. You can pull information from the pipe you chose to fill in the fields here. Message Text for example could be filled with the description of a task if you choose your 'Team Task Management' pipe. After you've set up your message and selected to whom you want it to be sent in the previous step, Zapier will show you a preview. If everything looks good, click 'Create and Continue' to test Slack. Once you get the 'Test Successful!' confirmation message, click on 'Finish', give your zap a name and turn it on! Using external apps to trigger an action on Pipefy means that whenever a trigger X happens on app A, an action Y will happen on Pipefy. Click on 'Make a New Zap' again. Our trigger un Google Calendar will be 'New Event'. 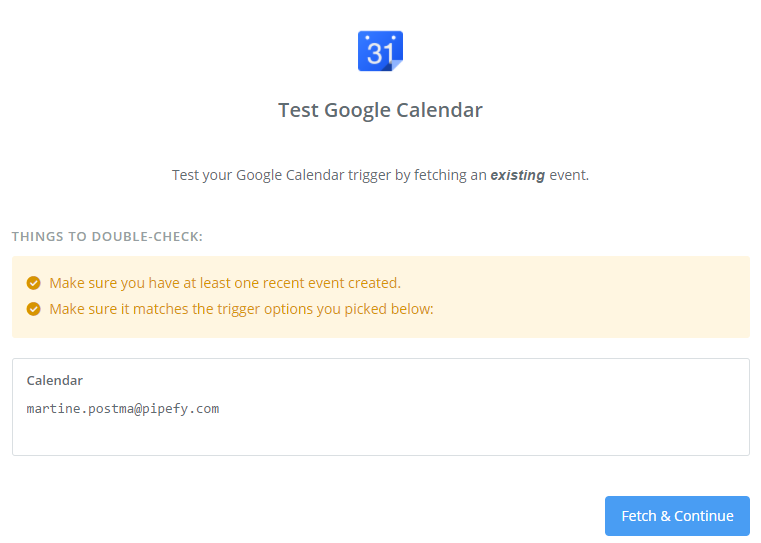 After you select the trigger, Zapier will ask you to select/connect your Google Calendar Account. Select your account from the list or, if you haven't set up one yet, click on 'Connect a New Account'. Select the calendar you want new events to be created in in order to trigger the action on Pipefy. I selected my own calendar. You'll get a notification if your test was successful. 7. Choose an Action App: Pipefy in this case. You can choose whether you want Zapier to create a new card, or to delete an existing card. For our example, we want a new card to be created. After selecting the action, you'll be asked to select your Pipefy account. If you haven’t connected it yet, you’ll be asked to add your Pipefy account. Learn how to do it by scrolling back up to step 1. Then you'll need to match the fields to "let Zapier know" which of the event's information you'd like to be added to your card's fields. 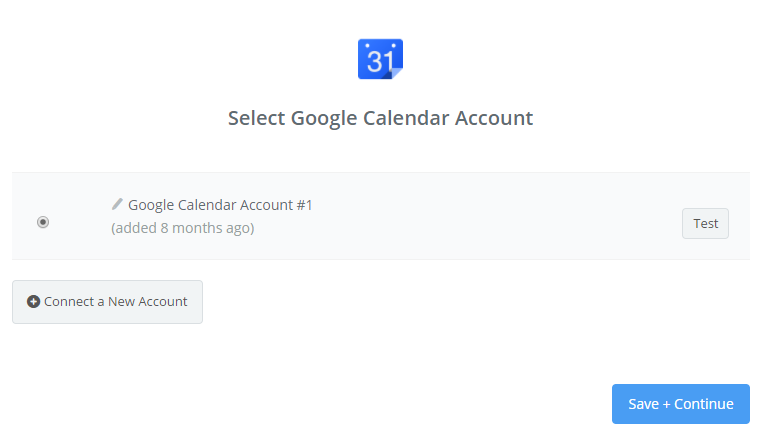 This means that the data from your Google Calendar event will be gathered and used to filled in the fields of your pipe's start form in Pipefy. After you’re done setting everything up, go on and let Zapier run a quick test to check whether everything is working properly. Zapier will display a confirmation message to let you know your Zap is up and running and that's it, your integration is ready to roll! Create card: Create a card on a pipe. Delete card: Delete a card on a pipe.